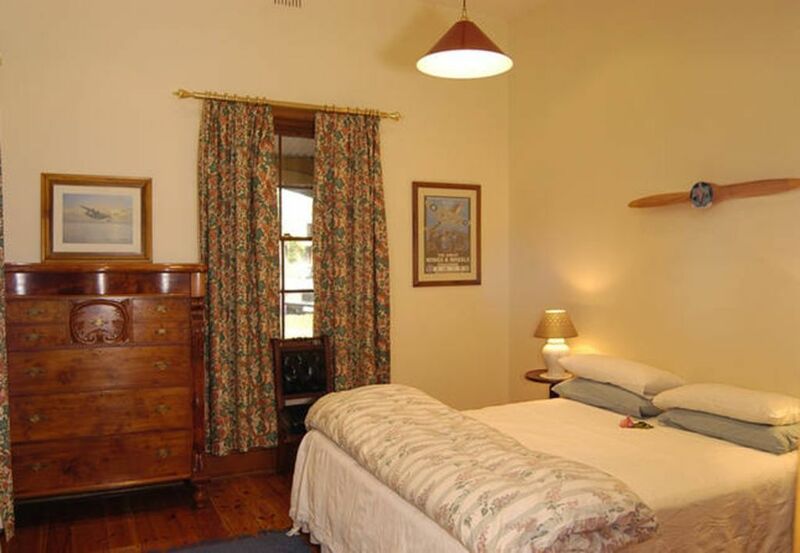 Stanley Cottage is a lovely stone cottage situated in a quiet tree lined street in North Adelaide, one street from Melbourne Street with its array of restaurants, open air cafes and boutiques and it is on the Free bus loop around North Adelaide and the City. The city is 1.5kms from North Adelaide. The cottage has a queen bedroom featuring Australia Huon Pine antique furnishings, a second mezzanine bedroom above the living room with a double bed, a bathroom with a walk in shower, parquetry floored living room with a large picture window overlooking the vine clad rear private courtyard. There is off street free parking for one vehicle behind the cottage and a self-catering equipped galley kitchen. There is also a washer dryer. There is also a double sofa bed in the lounge area. Was bought, restored and added to North Adelaide Heritage Group collection in June 2001. Stanley Cottage was built in 1880. Historically this cottage together with a number of adjoining others were built as a philanthropic gesture by wealthy colonial benefactors (Names such as Elder, Barr Smith, Bonython, Simpson, Simms & Murray) only 37 years after the colony was founded. They were essentially for aged and poor widows. Externally the cottage remains remarkably original, complemented to the west by cottages of similar scale & detailing. The extent and nature of these rows is reminiscent of 'Almshouses', such rows rarely found in South Australia. Typical Twiss touches are used aesthetically as well as practically, such as a real wall mounted wooden propeller blade from a bi-plane, substantial collectors Tasmanian Huon pine chest of eight drawers and robe, Ariston Hi-tech washer/dryer, large flat screen TV, a museum condition, double sofa bed, gilt mirrors and a selection of exciting large limited edition prints. Lighting, both natural and artificial is superb at all times. Colouring is three shades of light crème which tones warmly with the highly polished Baltic floors. The wide boulevard is quiet but still close to the avant garde cafes of Melbourne St (100 metres) & some of North Adelaide's most historic bars. Some of the best walks in the city emanate from here.